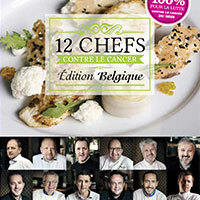 The chef Olivier Chaput, member of the Culinary Academy of France, disciple of Escoffier and Ile-de-France delegate of International Culinary College renews its commitment to the fight against cancer in 2016 and launches the sixth edition of its chiefs book. From 2012 on, he created an endowment « Pour Elles » (For Them) intended to redistribute the benefits of his Book of chefs and thus help women fight against cancer and support their families. On the menu of this book, recipes by twelve major Belgian chefs, but also dietary and nutritional advice from a professional person.